The easiest place to start the trip is in the pretty little town of Harrison Hot Springs. There’s a beach and public dock to launch your craft. If you don’t own a canoe or kayak, Steve at Killer Cove Boat Rental, is happy to set you up. The paddling is relatively easy as you drift downriver with the current. Unless you’re a spawning salmon, or using a motor, it’s best to do this trip one-way, with a car parked at your final destination. 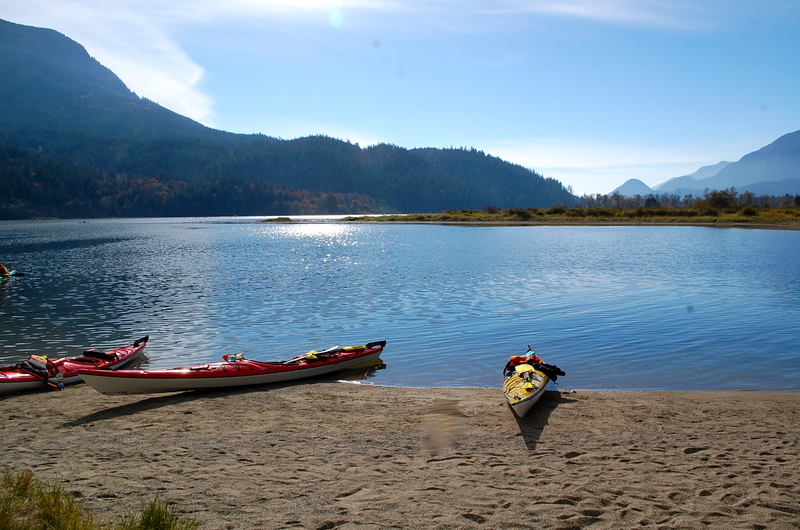 For many folks, including us, this was Kilby Provincial Park, about 18km from our launch at Harrison Hot Springs. I’d estimate that the actual paddling time is about 3.5 – 4 hours. I lost track with our many photo stops and leisurely lunch break. The scenery en route is outstanding. The river is wide, with rugged, steep terrain on both sides. The snow capped peaks of the Coast Mountains rise in the distance. There’s very little development along the shore and it feels wild and natural. The water colour varies from crystal clear, to deep green, to shades of glacial turquoise. There’s a perfect lunch stop just under the half way mark. On a nice day, it’s easy to spot, with plenty of kayaks beached on a flat, sandy bank at the mouth of an inlet—also a favourite place for fly fishermen. The large rocky outcropping makes for a great picnic spot and provides a panoramic view. The scenery is rivaled only by the dazzling display of spawning salmon. Some are energetically leaping, others are thrashing, some have turned vivid shades of red, and still others are floating listlessly, dead or near dead. Huge flocks of seagulls and bald eagle convocations gather in the shallows. It’s a spectacular show of life and death, and all the actors seem unperturbed by our presence. Harrison Hot Springs is about a 90 minute drive from Vancouver. Take Trans Canada Highway 1 East past Chilliwack to exit 135 and follow signs for Harrison. Call ahead to Killer Cove Boat Rental if you need a kayak or canoe. 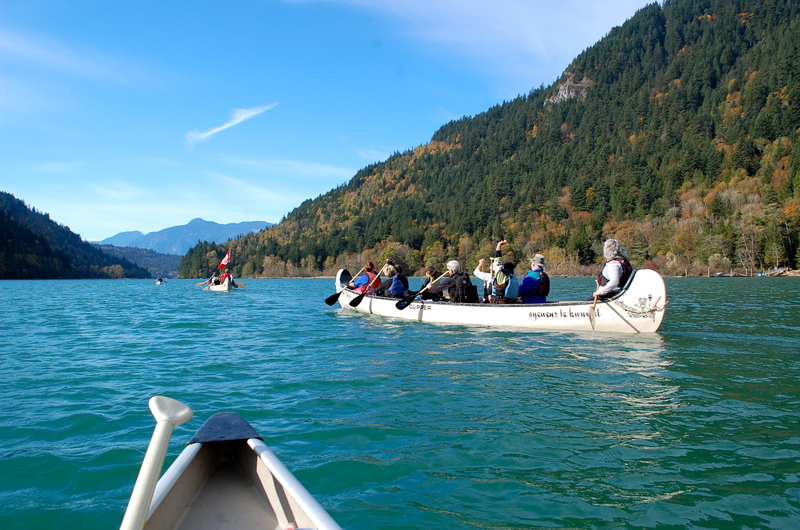 To do a one way paddle you’ll need two cars: one at Harrison Hot Springs and one at Kilby Provincial Park in Harrison Mills—about a 20 minute drive from Harrison off Loughheed Highway 7. At the end of the day, you’ll know you’ve almost made it to Kilby Park when you paddle under the Lougheed Highway bridge. Continue around the bend toward a tall stand of trees and you’ll see the beach and campground. Bring food, water, rain gear, and extra clothing (in a water tight bag). Fall days can be warm, but once the sun sets or the wind picks up, it’s mighty cold.